We kick off the Didriks tour of the Tour de France with Mauviel cookware. Today began Stage 6 of a 3 week long, 21 stage bike race covering 3,430.5 km (they use metric over there) or 2131.6 mi. The tour begins in the Loire region, up through Normandy, down Central France, across Southern France and back up to the Ile-De-France region where the race ends with the man in the yellow jersey at the Champs-Élysée (they use French over there) or Elysian Fields, an apt location since Elysium, in Greek mythology, was the final resting places of the souls of the heroic and the virtuous. Or the yellow jersey wearing champion of the Tour de France 2011. Today, the riders speed through Stage 6. They begin in the Brittany region, in the town called Dinan and ride into Lower Normandy, ending the stage at Lisieux, a small town almost straddling the border between Lower and Upper Normandy. 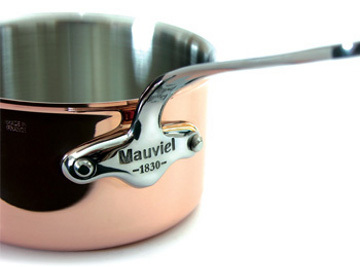 Lower Normandy is home to Mauviel, the French cookware company, established in 1830 by Ernest Mauviel in a village called Villedieu-les-Poêles, "the city of copper". Until recently Mauviel was a product favored by professional chefs and commercial markets for their unsurpassed quality and design. Now they are available to household markets like you through stores that appreciate products of Mauviel's caliber like Didriks. Mauviel continues to make their signature copper cookware line, the M'heritage line,M'passion Pastry, and M'tradition, but have expanded their design repertoire to include: stainless steel looks in their M'cook line and black anodized aluminum and ceramic in their M'stone line. Whichever line of Mauviel you choose, their long lasting and quality manufacturing will become heritage item that you can pass on to your future generations. Much like the Tour de France, Mauviel's in it for the long haul.